I’ve already seen some amazing things in the short while I’ve lived in a conscious existence on this Earth. But never before, have I seen such commitment and dedication to a hobby than that of Anthony Le, a 25 year old fitness consultant. 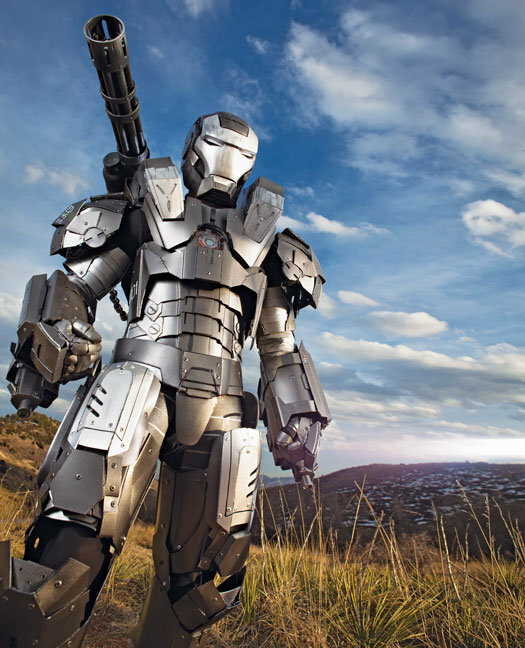 He has loved Iron Man since he was a kid, and has just finished constructing his impressive-looking War Machine suit, in time for the release of Iron Man 2. I thought you readers would love to see what Anthony Le’s suit looks like because to be quite honest, it is so astonishing I’m sure anyone with any interest in either War Machine, or design and construction might want to see this. Now, before I go into specs and the nitty-gritty on what this suit can do, and the numbers involved with making it, I just want to say that I love this suit. It is quite a wonder! Apparently, Le used some concept sketches found on the internet to base his design from. The armor is quite light, and made from high-impact urethane, it is thin but can apparently take being thrown against a wall without denting (lol). The helmet is made of resin from a clay mold, and the faceplate is motorised just like in films, so it can move up and down to reveal the wearer’s face. 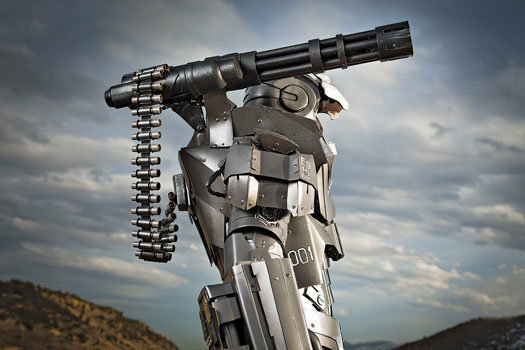 He also built a machine gun from PVC pipes and a motor, amongst other materials. I don’t think it is capable of firing bullets, but Le says it is quite capable of being adapted into a paintball gun. The gun can also rotate just as in the new Iron Man 2 film, and to activate it, he just presses a button in the palm of the suit’s glove. That is pretty impressive. The suit is fitted with a lot of LED lights in the eye sockets of the helmet and in the replica ‘arc reactor’ just as in the film and comic books. Obviously the arc reactor doesn’t power the suit, but it sits there in the chest plate looking quite cool. There are a few controls within the suit, that activate certain bits and bobs and gets the wearer attention from the ladies. I have already mentioned the button in the palm of the suit’s glove that activates the swinging machine gun. There is also a hands-free control panel in the chest plate of the suit, which activates the opening and closing of the mask’s visor. With the faceplate open, all the wearer needs to do is stand straight and point their arm forward, causing the hand-free button to press against the chest plate, thus causing the visor to close. That is cool. But if the button breaks whilst the visor is shut, I guess you’re screwed. When the visor closes, this also activates some red LEDs to switch on in the inside of the helmet’s eye sockets. That would look cool to see in the dark. Scary I imagine. Now, this all sounds very complicated, and by just looking at this visual masterpiece it must have taken at least a year to make, surely, right? Well, no. Nowhere close to that according to Le who says that he made it in just one month, at the cost of $4000(+). I personally think maybe that someone, somewhere down the line may have bent the truth a bit there. Though if that is genuinely true, then bravo to you Mr. Le! Bravo indeed! But who am I to question such things, after all, I am just amazed by how cool this suit is! Congratulations Anthony on making such an impressive and complicated suit that can do some seriously cool moves! Anthony Le is obviously a very committed fan who loves Iron Man and the technology involved with the character. I admire and totally respect that, and hope that any millionaires willing to take influence from Mr. Le’s train of thought here, leap on the opportunity to team up with him on making a suit like this, but one that can fly!